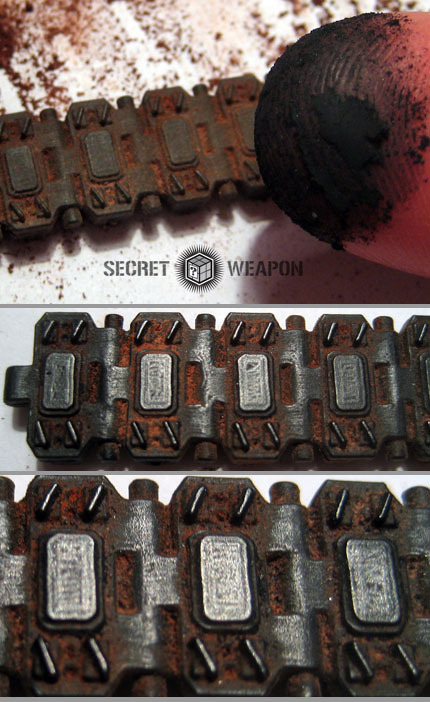 This tutorial will show you how to create realistic tank tread weathering with four of the Secret Weapon weathering pigments. The earth tones are available in the "Earth & Mud Weathering Pigment Set" for 10% off of the individual pigment price. Using more than one colour will help create a richer, more realistic weathering. This principle holds true for most applications but especially for rust, dirt, dust and mud. Starting with a black base coat allows us to take advantage of existing shadows as we apply the pigments. Using an old brush I add Dark Earth over most of the tank tread. Next I apply Terracotta Earth. Going from dark to light puts the lighter colours on the top of the tread and will create the look of dried, old dirt on our tank. If you want to go with a fresher look then go from light to dark so that the darker colour, more representative of fresh mud, is on the top. Apply the colour unevenly and in a splotchy pattern. This will keep the weathering from looking too uniform and increase the realism. Next I apply Clay Brown in dense, uneven sections. This creates the look of dry mud or sandy dirt. 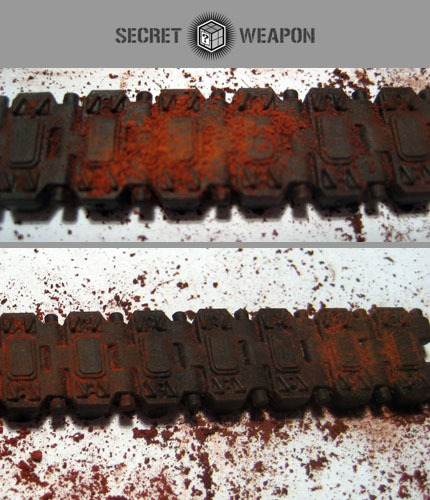 You can already see the weathering pigments bringing out the detail in the tank tread. This was done without the addition of any thinners or additives using only an old brush and the pigments, straight out of the bottle. Last, but certainly not least, I'm going to dip my fingertip into a bottle of the Metallic Iron weathering pigment and rub it gently over the top of the tank tread. In the top image you can see the tread before the Metallic Iron weathering pigment goes on and in the bottom two the difference it makes. 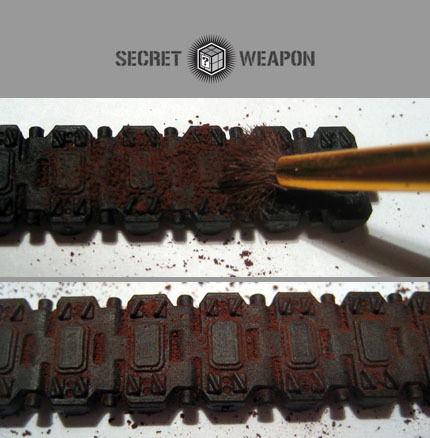 This has the effect of creating realistic rubbed metal tank treads without the risk of overdoing it with drybrushing. 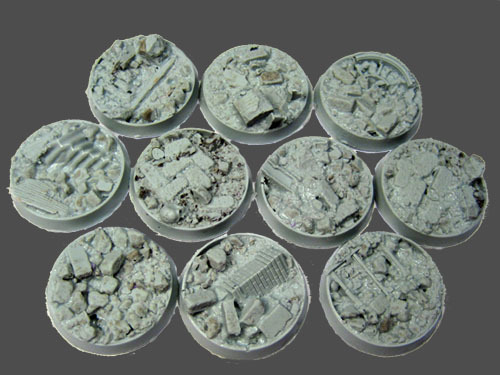 By modifying the density of your weathering pigments, the colours and the order of application, you can create realistic weathering on your miniatures in models to match any environment that you can imagine. I spent less than five minutes weathering this section of tank tread and it's gritty, dirty and realistic. However it's never too late to go back and add more pigment. I could go in now and add more earth tones or, for a desert environment, add some Burning Sand weathering pigment to bring out more of the yellow tones. Ash Grey would give me a dusty, urban look. Pigments should typically be the last thing that you apply to your model. If you're going to game with the model I recommend that you finish everything but the pigments, seal the model with a clear and/or matte varnish, then apply your pigments followed by a very light layer of matte sealer to hold the pigments in place. Keep the sealer roughly 12" from the model and do a couple of light, quick passes. Remember to shake the sealer thoroughly and keep it at the recommended temperature on the can to avoid frosting effects and apply it only lightly. The goal is to keep the pigments in place - not to protect the model. 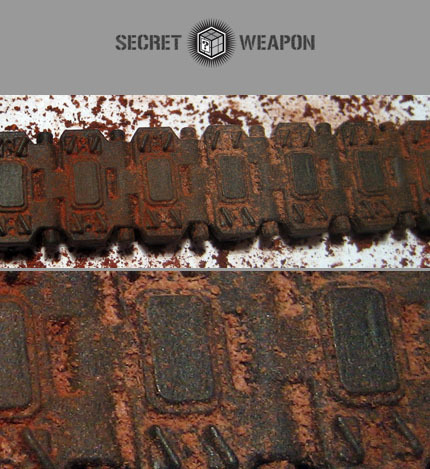 Weathering pigments are an amazing way to create realistic weathering on your models and miniatures. 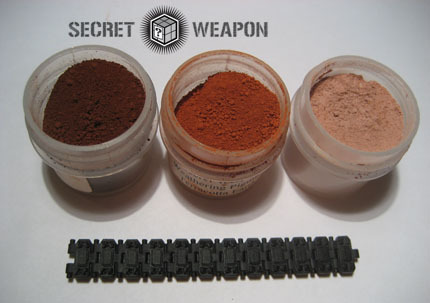 Take a minute to check out the full line of pigments available from Secret Weapon and take your weathering to the next level.